What do you need to get gigabit speeds on your network? Last week our tip talked about the differences in cables and which type you would need to get gigabit speeds on your network. However, you need more than just cables to get gigabit speeds, you also need some gigabit-compatible hardware. Let’s take a look at those pieces now. Here’s how a router works – Every device on the Internet needs a unique IP address. Your Internet Service Provider, or ISP, provides you with one, allowing one device to access the Internet. A router will access the Internet through that IP address, then provide local IP addresses for the PCs and other devices connected to it. This allows you to access the Internet from multiple computers through one connection. When it comes to upgrading network equipment, the router is a really easy piece of equipment to overlook, especially if it’s still running stable and providing a solid connection to your devices. However, it’s the device through which all your devices get their internet connection. So, updating cables or other network equipment won’t make a difference if your router is too old to handle the connection speeds. Switches are useful when you find yourself needing to connect more devices to your network with cable than is available from your typical 4 port router. Switches simply extend the amount of ports you have available in the same way a power strip gives you more outlets to plug in power cords. 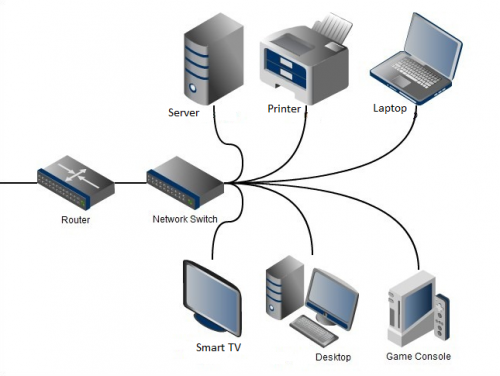 Home networks these days typically rely heavily on wireless to connect all the devices (like tablets and smart phones) so switches aren’t usually necessary, but work networks find switches absolutely necessary in order to connect all of the printers, desktops and servers typically found in an office. If most of your equipment is newer but you find the transfer speeds on your network to still be painfully slow then it might be time to update the device that all of your data is passing through. The last piece we’re going to look at is whether or not the device you are using is gigabit compatible. The good news is, gigabit capability has pretty much been standard fare on desktops and laptops for quite a while now, so chances are good that your computer already supports it. If you want to know for sure though, click your start button, type Device Manager, then look down the list to for Network adaptors. Click the arrow beside Network adaptors to expand the list and search your favorite internet browser for the details on the one that says something about Ethernet Connection. If you’re running on an old XP machine you’re probably out of luck. Remember, network speeds aren’t the same thing as internet speeds. You will notice the better network speeds when transferring files between computers, streaming videos or music between devices or backing up your computer to another location on your network. If you have any questions about your network or networks in general, please feel free to ask!